- Prepare the polenta. This really depends on the type of corn meal you have. I prefer the instant type - it is quick and easy to prepare, and it reduces the changes of burning the recipe. For each person, you'll need about two cups of water. Boil the water with a pinch of salt. When it is boiling, reduce the heat to medium, stir, and slowly add the corn meal. Keep on stirring - you need a uniform mix. I end up using about a cup of corn meal (but again, it depends on what type you use) - I stop adding the corn meal around the time when the mix has the consistency of sour cream. Don't worry if it's too thin - it'll get thicker as it cooks and cools down. Continue following the directions on your corn meal package (the instant version is ready in 5 minutes, but other corn meals might required half an hour or more of cooking). - While the polenta is cooking, fry a couple of strips of (smoked) bacon in a pan. Remove the bacon, then fry the egg. - Place a tablespoon of butter on a clean plate, for each guest. - Add about two cups of hot polenta on top - this will melt the butter. - Add sour cream and feta cheese, to taste. I use about three quarters of a cup of it, mixed half-half. 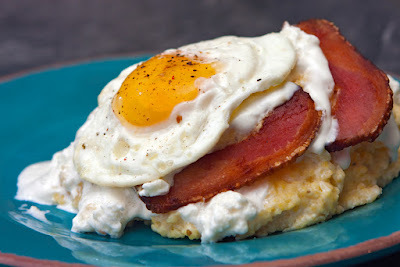 - Add the bacon strips and the fried egg on top. - Add salt and pepper to taste. Note: don't add too much salt, as the feta cheese is already salty. - The recipe naturally has three colors: yellow, white, and red. Serving on a plate of complimentary color makes it look even better. - Present the ingredients stacked, with the egg on top. It looks best this way. - When eating the dish, I like to mix everything thoroughly. Delicious, but does not provide the best presentation for the recipe. I googled "cream cheese recipe" since I have cream cheese in the fridge that I'd like to use up and yours came up as the first result (first time Google's personal search actually gives me a personal search result). Came here to check it out, but turns out that what you use in the recipe is not cream cheese. Still, nice to be reminded of your cooking blog; everything looks so good and I'd have to try making one or two things from this blog soon :). Irene. And I need to publish some recipes with cream cheese, Irene. :) Let me know if you end up preparing anything, and if so, how you liked it.